First of all, I just want to thank you for putting out this blog and educating people on what goes on in farming – past and present. I’ve been faithfully reading for about a month now. I learned a lot of farming techniques from my grandfather who had acres of rice and vegetable fields in the Philippines. When he moved here, he grew many types of vegetables in our backyard. I don’t have a green thumb but my husband does, so I leave all the growing to him. I have a degree in science and yes, I have a lot of science background and now work in the medical field. I have a degree in Biology but that does not make me a biologist. 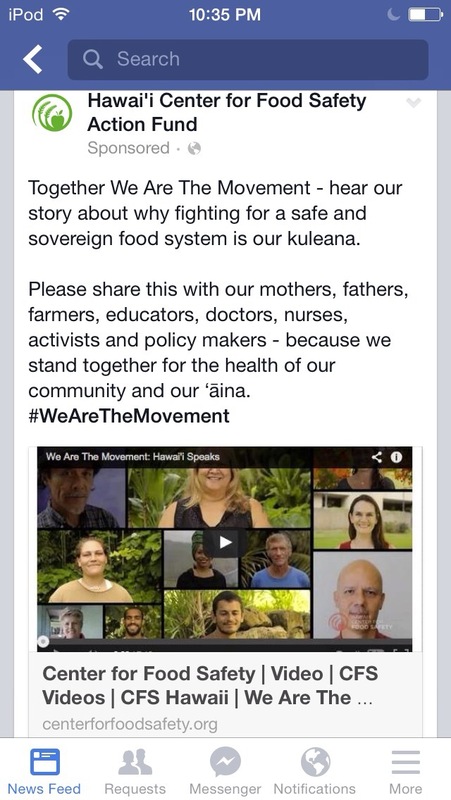 The SHAKA movement has someone claiming to be a bio-geneticist (whatever that means). That’s their comeback to scientists who actually have experience in their field? You’re right. People have been emotionally spent through this whole election. We’ve been bombarded with false claims. It was too much for me to ask that people separate themselves emotionally and figure out what this initiative was all about. Was it about GMO, chemicals, Monsanto and Dow? It was too much for me to get someone to explain (in simple language) from the YES side what GMO/GE was. Inserting chemicals into the DNA/plant, were some of the answers I got. It was frustrating, to say the least, that they couldn’t explain what they were so passionate about, but had no clue how to respond. Sad. The most upsetting thing that I heard yesterday was that they thought the Filipinos (and apparently, only Filipinos work there) who work for Monsanto all had work visas, gave all their money back to their families in the Philippines and did not contribute economically to Hawaii, so they only ‘sleep’ here. Really? These are people who have families and homes on Maui. Maui IS their home. They work hard so yes, they give back what they can to their families. What? They don’t eat? Don’t they buy their groceries at the store, fill their cars with gas, buy clothes? How many of the YES people are mainland transplants? How many of them think they can just come here and decide what’s best for Maui?? Don’t make it a race issue. That’s beside the point. They should pick up a genetics book and look up DNA and genes. They can do it while they’re camping out in front of Monsanto. Maybe someone should warn them to leave. They might get sick. It was very disturbing when the race issue was brought up in Kauai. The word going on in the activists’ circles was that they are just low wage workers inferring that they are expendable. That just blew my mind. We all start off some where and many of these workers support family members who will eventually be contributors to our society. We are having a brain drain occurring before our eyes. I can’t sit back and let this happen. Thank you for commenting and following these issues. It should be known that the this Maui Law has criminalized the growing of broccoli and many tomatoes, among many other crops. (a) In vitro nucleic acid techniques which include, but are not limited to, recombinant deoxyribonucleic acid (DNA) or ribonucleic acid (RNA), direct injection of nucleic acid into cells or organelles, encapsulation, gene deletion, and doubling; or (b) Methods of fusing cells beyond the taxonomic family that overcome natural physiological, reproductive, or recombination barriers, and that are not techniques used in traditional breeding and selection such as conjugation, transduction, and hybridization. The National Organic Production standards were based on an ethical position that laboratory manipulation of living things is unethical (an ethical position that I, as a biologist, and a person who is alive today because of modern medicine based on laboratory science, don’t share). But they apparently didn’t realize at the time that gene doubling had been used widely, as well as another technique called cell fusion, and that many of the varieties of tomatoes, corn, cauliflower, Brussels sprouts, broccoli, barley, etc., including many cultivars grown by certified USDA organic farms, had been produced using these techniques, or were derived from parental strains produced through these techniques. Basically, now in Maui, if you plant broccoli or tomatoes, the Shaka-Truppen will come for you in the night. I thought a blank vote is a no vote? Even if not, the Yes votes did not exceed 50% of all voters. Hmmmm makes you wonder……….is this really a victory for them?